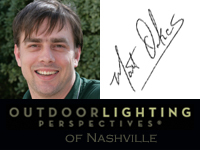 Outdoor Lighting Perspectives of Nashville explores what your favorite holiday hue says about you! When it comes to making decisions about choosing the colors used in your holiday decor each year, do you think with your heart or your head? Holiday decorating, and especially holiday lighting, is a realm of design with the sole purpose of heightening the senses and adding beauty to your surroundings. Not only is holiday lighting a visual experience, it can also trigger happiness and joy by conjuring up memories and nostalgia of Christmases past. 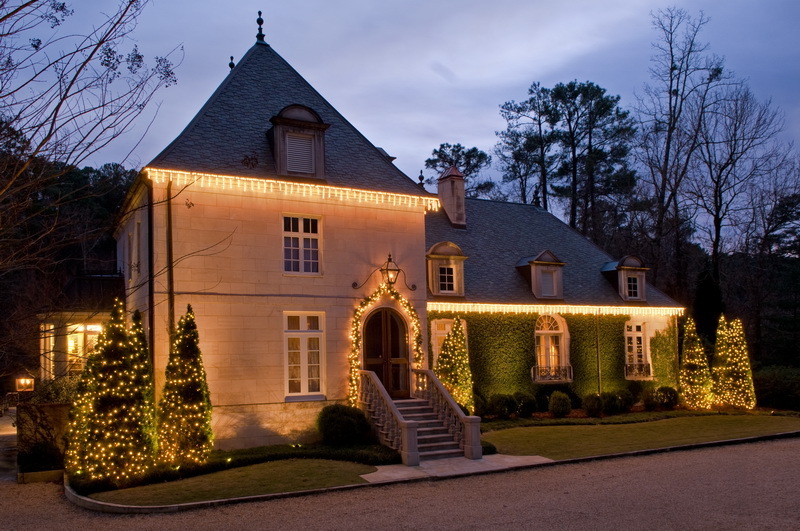 Outdoor Lighting Perspectives of Nashville offers holiday lighting customers a large selection of traditional inspired lighting designs. We also specialize in staying on trend with bold outdoor lighting designs that make you think outside of the box. Here at Outdoor Lighting Perspectives of Nashville, elegant white and clear outdoor lighting is among our most requested for the holidays. Customers love the simplicity and refined elegance that comes from using white and clear lights in their holiday display. Many homeowners are apprehensive about adding color to their holiday display because they cannot visualize their outdoor lighting display using colors. One of our most popular holiday lighting colors is white, but there is much to be said about adding colors to your display too! Research indicates that visual thinking is common in approximately 60%–65% of the population. Visual thinking is the phenomenon of thinking through visual processing, which includes being able envision design ideas while they are in the planning phase. Many homeowners are reluctant to make the leap from the holiday lighting they have grown accustomed to and go for the gusto when it comes by using bold colors for this very reason. We have had great success by adding colored holiday lights to our displays over the years. Just by adding a singular colored signature tree, or a group of balancing lit trees to your display you can make your landscape really stand out. 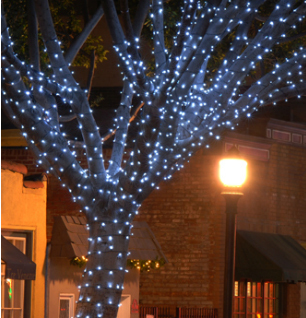 As part of our outdoor holiday lighting program, our designers can provide examples of how much your display could benefit from adding color. Our talented staff can help you decide the color that best suits your individual landscape and personal tastes. Maybe you have a favorite holiday hue in mind and are “on the fence” about moving forward — Maybe you have no idea where to begin — Choosing the right color can be a very personal choice, and to better help with your outdoor lighting selection we have put together a checklist of what your favorite color says about you. 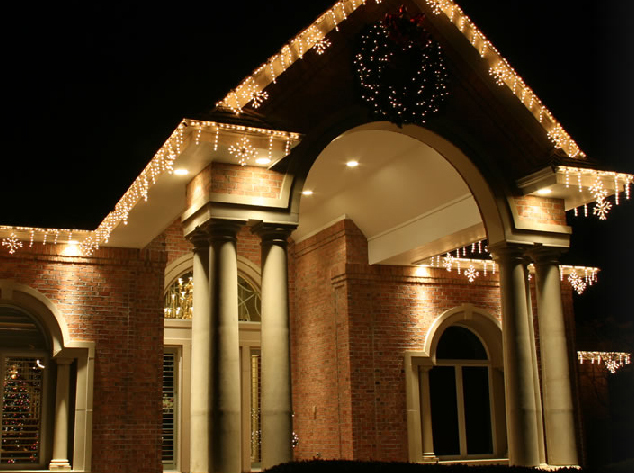 This information will help in deciding the best color addition for your holiday lighting display. This majestic home is lit with red along the home’s entry to add drama for the holidays. Red- the attention getter – This classic color is the epitome of Christmas, from being the dominant color of candy canes and Santa’s suit and who ever heard of Rudolph the green nosed reindeer? 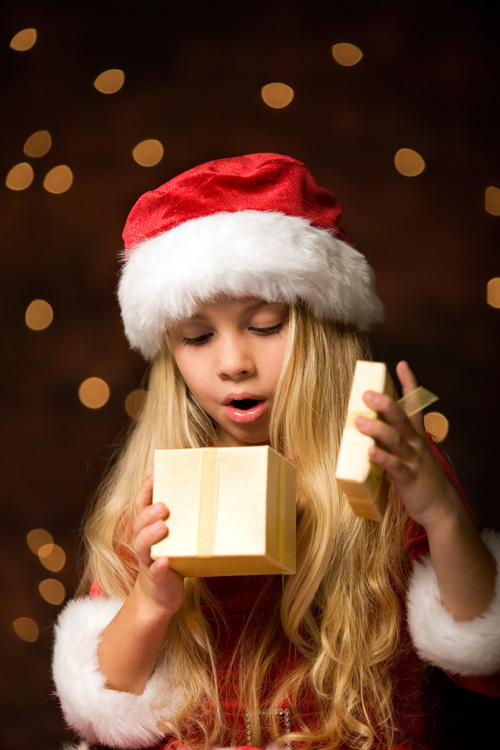 Using the color red in your holiday lighting display ignites excitement and gets attention. Red is known as the color of energy and the symbol of life. It evokes strength, power, and creates a visual impact. Using red can cause onlookers to stop and look at your holiday display in the same manner a traffic light causes us to halt when it turns red. This wrapped tree lighting done in blue lights is mesmerizing . Blue- the color of snow – Overall, blue is a calming, restful color and is the first color that comes to mind when you envision a winter wonderland. Blue is associated with serenity which makes it a perfect holiday lighting color choice to create a tranquil lighting display. Green- the equalizer – Green is located at the center of the color spectrum and is considered the color of balance and restoration. Green is the color we associate with nature, making it a solid choice for a holiday lighting color for use outdoors. Green is also a calming color and is associated with hope, generosity and peace. By using green you can add balance and harmony to your Christmas lighting. This display features a signature tree in blue holiday lights. Purple – the royal color – Purple is known as the color of royalty and is associated with prosperity, wisdom, and sophistication. If you want to add drama to your holiday lighting display, try using purple. Using this hue can also evoke meditation and spiritual awareness making it the Zen choice in Christmas lighting. White – elegance and innocence – This classic holiday lighting color is a symbol of purity and innocence. White lends itself to simplicity and freshness when used in a lighting display. The perfect color for emulating the look of a white Christmas, even if you lack the snow! 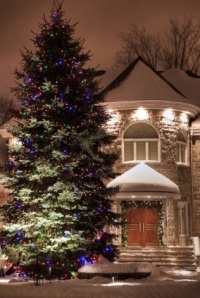 No matter what holiday color strikes your fancy, Outdoor Lighting Perspectives will custom design your display to suit both your tastes and your home’s architecture. Our professional lighting designer will upload an image of your home onto his or her laptop computer where you and the designer will work side-by-side during an in-home design consultation to create just the right look for your home. 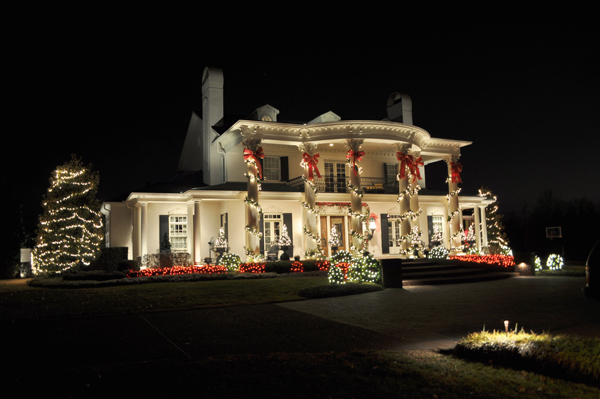 Let Outdoor Lighting Perspectives of Nashville make your holidays the most magical ever with lighting! This entry was posted in Christmas Lighting, Holiday Lighting, Holiday outdoor tree lighting, Nashville Holiday Lighting and tagged Christmas lighting Nashville, holiday lighting Nashville, How adding color can add beauty and drama to your Nashville outdoor lighting display, LED Christmas lighting Nashville, LED holiday lighting Nashville, lighting design, lighting specialist, Lighting Tips, Nashville Christmas Lighting, Nashville colored holiday lighting, Nashville holiday colored outdoor lighting designs, Nashville holiday lighting, Nashville TN commercial holiday lighting, Outdoor Lighting in The Gulch Nashville TN, outdoor lighting Nashville, Permanent Festoon commercial lighting in The Gulch Nashville TN, Solid colored Christmas lighting Nashville TN, The Gulch Nashville TN by outdoorlightingnashville. Bookmark the permalink.